ALBUQUERQUE, N.M. — One of the forgotten footnotes of Jimmer Fredette's memorable 52-point explosion in the semifinals of last year's Mountain West tournament involved a guy whose body wouldn't let him finish the game. 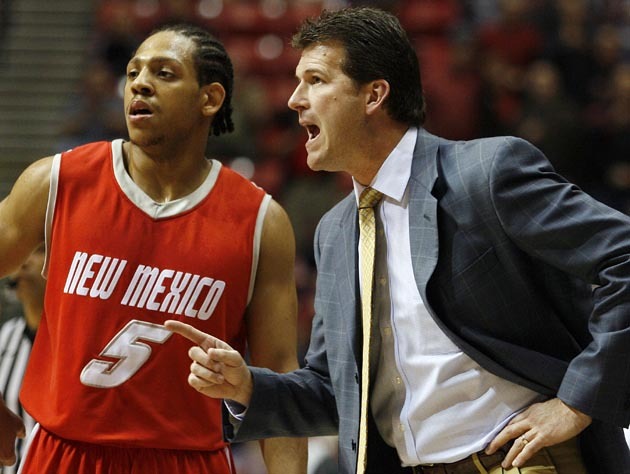 That guy was New Mexico senior point guard Dairese Gary, who was one of Fredette's most worthy adversaries in league play over four years and a perennial all-conference performer. Almost a full year after that fateful night in Las Vegas, Fredette is now a millionaire and learning the professional ropes with the NBA's Sacramento Kings. Gary is still on the bench for New Mexico, but, for the time being, he's traded a uniform for a polo and some slacks — standard get-up for a graduate assistant — while waiting patiently for his opportunity to play pro ball to come around. "He's healed, he's doing well, now it's just a matter of waiting on the phone call and getting the chance," Lobos coach Steve Alford said. "It's a hard time of the year. Not a lot of people are getting called up or getting jobs overseas this time of the year. "He might have to go a complete year here, but he'll get a fight." In the 130th consecutive start of his college career, Gary was leading a desperate team. Just a year after winning 30 games and earning a No. 3-seed in the NCAA tournament, New Mexico entered the 2011 Mountain West tourney at 20-11 and likely needed to win the whole thing to make a return trip to the field of 68. After taking care of Colorado State in Thursday's quarterfinals with relative ease, the next hurdle was taking down No. 8 BYU and the red-hot star guard simply known as The Jimmer. As Fredette pieced together the memorable 52-point flurry that saw him hit 22 of 37 shots and attempt only one free throw, Gary was keeping his team in the fight, with nine points, seven assists and only one turnover before he went down early in the second half. The official diagnosis — a torn anterior cruciate ligament in his right knee — didn't come for another day or two, but when he crumpled to the floor and was helped to the locker room, it was apparent to all watching right then that Gary likely wasn't coming back. Without him, New Mexico couldn't keep up all the way until the end and fell, 87-76, punching its ticket to the NIT. Gary watched the final minutes from the bench with a blank stare in his eyes, having suffered the most ill-timed season-ending injury one could ever imagine. After the game, he struggled to convey his thoughts to reporters while choking back tears. "I just wished I was in there for the battle," Gary recalled. "It was always fun to go against Fredette, just taking that chance to try to guard him. Him scoring 50-plus points, it was kind of a stinger." When the stinger subsided, Gary and Alford sat down back in Albuquerque to hammer out a game plan. When Alford accepted the job at New Mexico before the 2007-08 season, the first recruit he locked up was Gary — a strong, bullish lead guard hand-picked from Indiana, where Alford was both a high school and college legend on the hardwood. Alford and assistant coach Craig Neal had already been recruiting Gary to their former program — Iowa — for quite some time. Gary played a key role in each of Alford's first 97 wins at New Mexico, and Alford now wanted to help him see his dreams through, despite him needing to first overcome a career-threatening injury. "[It meant] a lot because I know that's what he wants to do," Alford said. "He's a terrific kid, he got his degree on time and he meant so much to our program. We'll always take care of Dairese." Added Gary: "He always told me no matter what happens, he'd take care of me regardless. I had no question about that, but he did have to tell me it would be hard, I'd have to be patient and it was going to be a long road." The surgery was a success, and after letting his weight balloon a bit before starting rehab, Gary charged forward just as hard as he had for four years while bringing the ball up for the Lobos. The injury obviously delayed a professional career, but in many ways, it also turned out to be a blessing in disguise. Forced to work on his outside shot before he was able to sprint and cut, Gary now claims to be a better shooter than he was at any point during his New Mexico career, during which he was a 45.3 percent shooter and a 36.5 percent marksman from long range. "Coach always teases me," he said. "He always says the doctor put something in there to give me a jumper." He's also been able to heal his entire body, not just the knee. One of the more rugged, fearless players in the nation over the past four seasons, Gary's aggressive approach to the game meant he often had to play through nagging injuries, including ailments in his wrists, his back and several other spots. Gary performs a court workout at least once a day, and said he plays in various leagues around Albuquerque two or three times a week. At first, when he would show up, opponents were very hands-off with him, well aware of his situation. Now, he's treated like any other guy. The one thing Gary said is not yet all the way back is his explosiveness. But what he might be lacking in burst, he said he feels he's gained in terms of the mental approach to the game and how offense should properly develop. He's picked up by simply observing from the end of Alford's bench this season. "I have just a different outlook on the game," he said. "I'm thinking the game through rather than just using my athletic ability." And if, down the road, coaching is something Gary chooses to pursue once he can no longer play, he'll have a year of valuable experience under his belt. For four years, Gary was an extension of Alford while on the floor, and had every trait coaches scour the prep ranks for every year in a backcourt leader. Just how valuable that was to the Lobos was apparent for the better part of this season, as they struggled early on to not only replace his production, but also his intangibles. They ultimately overcame it, and with Saturday's 65-45 throttling of then-No. 11 UNLV, the Lobos won their seventh consecutive game and took a two-game lead on both UNLV and San Diego State atop the Mountain West standings with only four games left to play, virtually locking up a regular-season title. It's been a fun ride for Gary, and Alford would likely keep him around for a while if that's the path he wanted to head down. But both are hoping that the career choice between playing and coaching is one Gary doesn't have to make for a long time. "I still have the passion and the hunger, and I don't think there's too much that could stop me now," he said. "If somebody gives me the chance, I'll be able to play." Ryan Greene also covers UNLV and the Mountain West Conference for RunRebs.com. Follow him on Twitter at @ryanmgreene.